Just a quickie post today. I've posted about this place before but one morning I took a walk here from my friends place and popped in for an eye-opener. It is quite a big place, dining room and all, but only one part of it was of any interest to me. Being up north I decided to have something traditional, a shot and a snert. The shot was Old Crow, an old-time favorite of mine that you don't see much of in New York. Floyd was using it in their Mint Juleps on Kentucky Derby Day though. I have no idea what was in the snert. 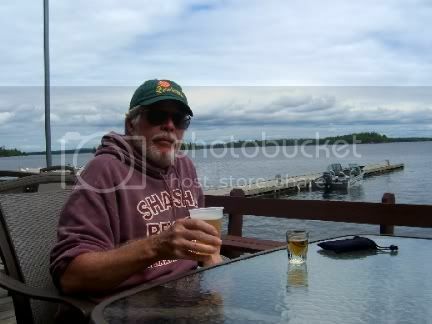 It was a nice enough morning so I decided that I would take my morning libation out on the deck overlooking the lake. Although I was perfectly content out on the deck, not everyone felt the same. A brisk morning walk and a heart stimulant. I felt oh so healthy. 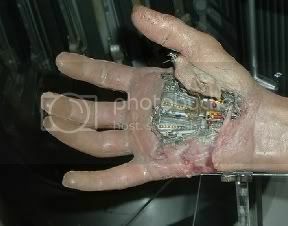 Several readers of my blog have sent me emails asking, Is that Chris's real hand? It looks so, well, manicured. It is not. Chris, a Minnesota Gopher football fan once attended an away game at the University of Wisconsin. Bucky, the Badger, in a drunken frenzy, bit off my friend's hand. Sadly, Bucky remains free while my friend Chris has to carry his burden with him for the rest of his days. Unfortunately, it took a bit of a hit with the flaming Absinthe. We are hoping that either his health or automobile insurance will allow him to upgrade to the latest model prosthetic. This one does almost everything. This is a vast improvement over the earlier models. Well, there you go. But please, no more questions about prosthetics. Penile implants are strictly off-limits. 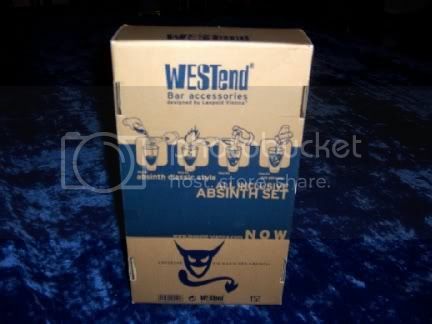 Several years ago while in Switzerland I ran across a liquor store that sold what I thought to be a most interesting product, an Absinthe kit. Not just a bottle of Absinthe, but a kit. How could I resist. Building a drink would be kind of like building a model airplane. 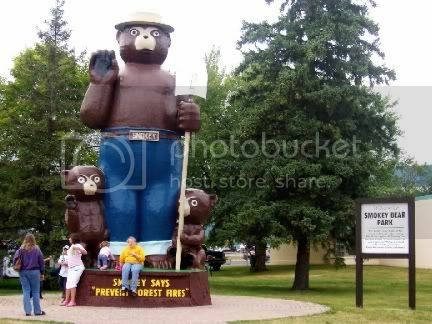 One that would eventually go down in flames. The kit consisted of two very small bottles of Absinthe, disappointing small, two nice glasses, and a metal thingie on which you could place a sugar cube or two. Traditionally drinking Absinthe involves a bit of a ceremony. 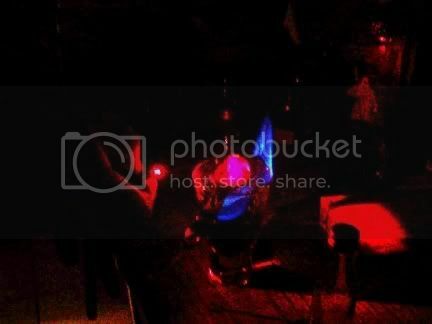 This generally consists of placing a sugar cube or two on a thingie which is then suspended above the glass containing Absinthe. Cold water is dripped onto the sugar cubes When the water drips through them it drips into the Absinthe creating neat little creamy colored droplets that gradually turn the Absinthe a milky green. This is a very cool effect. 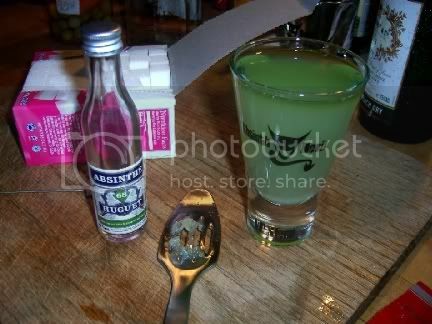 Actually, while getting the above picture I discovered that thingies are really called Absinthe spoons, duh! Interestingly, the instructions on this kit called for a bit of a different procedure, one involving fire. You do suspend the sugar cubes above a glass on an Absinthe spoon though. 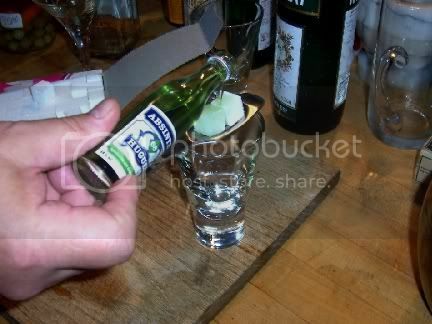 However, step two calls for slowly pouring the Absinthe over the sugar cubes so that it drips into the glass. When you are through you have sugary Absinthe in the glass and two Absinthe soaked sugar cubes sitting on the Absinthe spoon which is resting above the glass. Then, and I think this is just what you want drunken people to be doing, you ignite the sugar cubes. 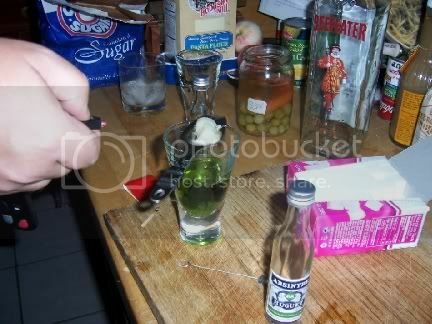 Flaming sugar cubes above a glass of 124 proof Absinthe, a perfect recipe for disaster. Or, at least, a spectacle. Well, you might have to use your imagination a bit. We had to turn off the lights so it would look cool. When the sugar cubes melt into the Absinthe you blow them out (very important) and then stir some cold water into the mixture. Our second attempt we let the sugar cubes burn too long and the glass cracked. 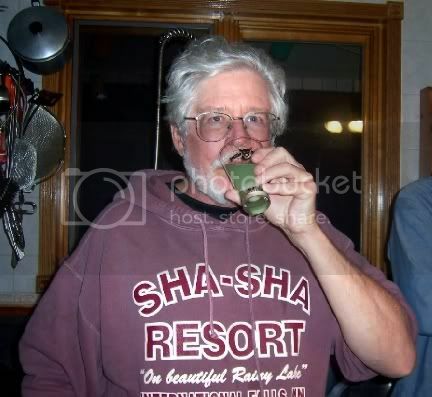 Idiots that we were, we drank it anyway. This process results in pretty much the same end-product as the more traditional, less hazardous, and less messy method. I want to give a special thanks to my friend Chris who acted as the hand-model for this shoot. It was a fun experiment and the end-result was good. I am a big fan of Ouzo and Pernod. 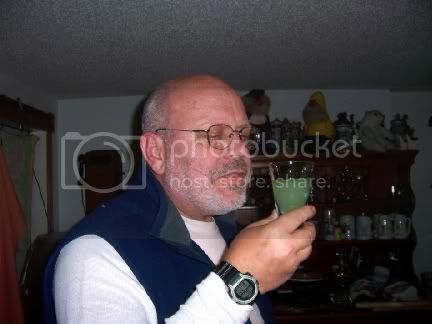 I drink my Pernod straight with an ice-cube so it is very similar. The Pernod is a lower proof then Absinthe and sweeter. Pernod was one of the original distillers of Absinthe but switched to Pernod when Absinthe was made illegal throughout much of the world. The reason for this, not surprisingly, was based upon totally incorrect assumptions. Heavy Absinthe drinkers supposedly suffered from hallucinations and other interesting side-affects. Because animals given large doses of wormwood, an ingredient in Absinthe, suffered from convulsions it was concluded that the wormwood in Absinthe was the culprit and so it was outlawed. We now know that the amount of wormwood contained in Absinthe was far too low to have contributed to any such affect. It didn't seem to occur to anyone that because Absinthe was sweet, tasted like licorice, went down like candy and, oh, contained between 60% and 70% alcohol might have been the problem. 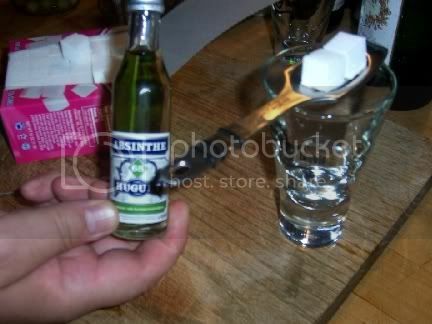 Of course you couldn't possible outlaw all good tasting high alcohol drinks so poor Absinthe had to pay the price. 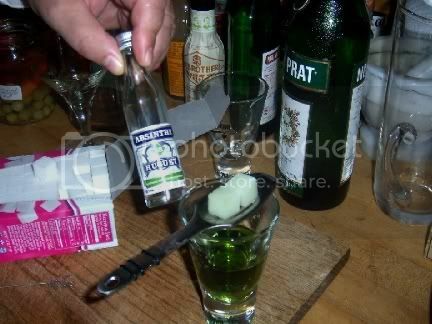 Laws have been changed though so that it is now possible to buy Absinthe made as close to the original recipes as possible, even in the United States. And, joy of joys, Pernod is back in the Absinthe business. I haven't seen it for sale yet, but you better believe I will be searching it out. This one is a nifty 68% alcohol. Don't be blaming it on the wormwood. Well, I did a little drinking, but just not Bass. 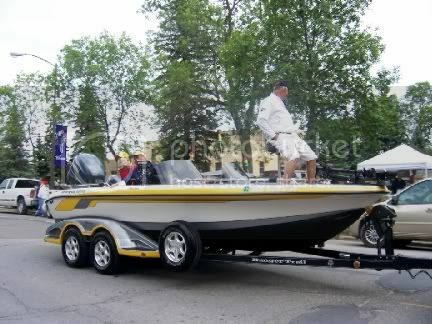 I was up in Northern Minnesota visiting my friends Bruce and Donna and the day after I arrived it was the start of the International Falls Bass Championship festivities. In conjunction with the fishing contest there is a nice little fair and crafts show in the Smokey Bear Park. Hmm, deep fried cheese curds and Pronto Pups (Corn Dogs to those of you not from the midwest). 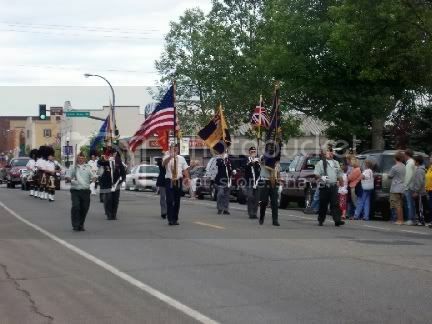 There is also a parade that is quite entertaining in a small-town sort of way. Particularly if you like boats. It started off with members of, well, I am not sure, presenting colors. 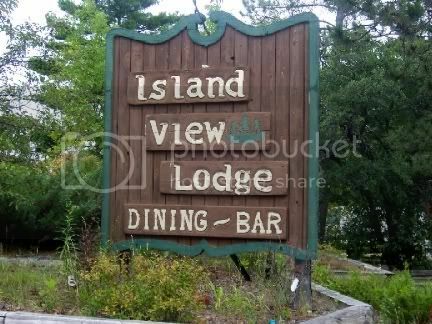 Maybe it was the American Legion, but there might have been a few Canadians in there too. 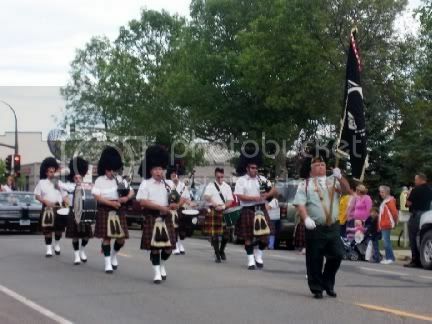 This was followed by the inevitable bagpipers. I don't know why, but they just love bagpipers up here. 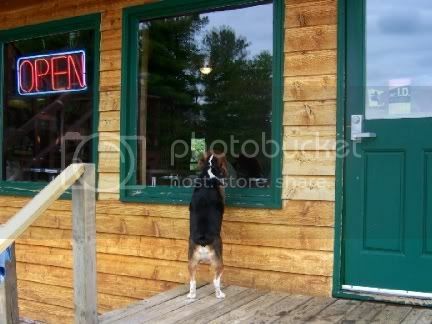 You may remember that one even showed up when I hit bar number 777 at Woody's Pub. And, of course, every parade has to have its queen. This year Holly Strain was "Miss Fun In The Sun." There should be a pun in there somewhere, but I had my mind on a nice piece of bass. Ooh, I really had to strain for that one. 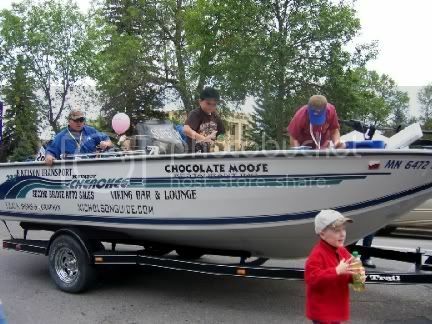 And, of course, there were boats instead of floats. But then, boats do float. There were quite a lot of boats, actually. Fifty-nine boats, each with a two man team were entered in the event. Not a huge contest, but there was $30,000 in prize money and first prize was $10,000. Most of the entrants were from around the area. 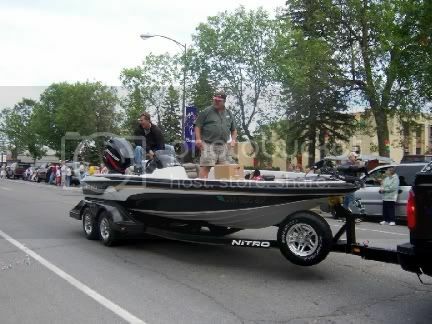 There is another, much larger professional bass tournament held in Rainy Lake, but I think that one is in Canada. All the fishing for this one was done on the United States side of the lake and in the Rainy River that flows into the lake. 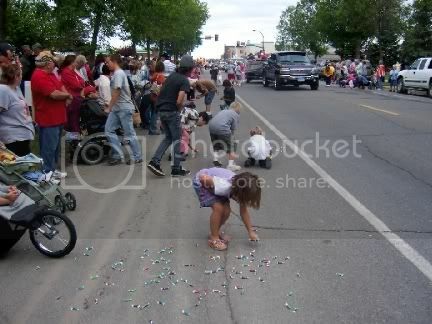 The kids really enjoyed the parade, largely because there was a lot of candy being thrown about. If it doesn't lay in the street for more then 10 seconds it is safe to eat. 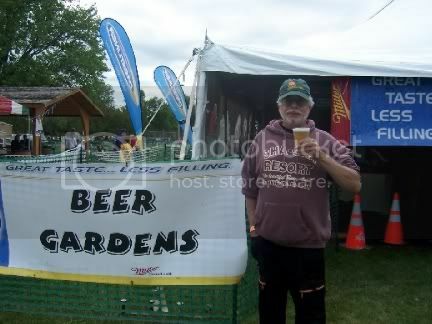 Of course what is a bass fishing contest without a beer tent. And of course I was more than happy to contribute to whatever cause it was supporting. 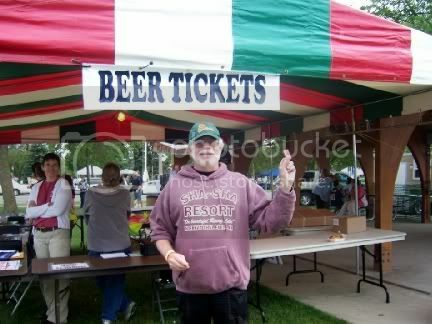 Much better to buy a ticket for beer than to be ticketed for drinking beer, in my humble opinion. But I only get ticketed for drinking beer when I do it in the New York Subway. I knew that insulated back-pack with the keg of beer in it would get me in trouble. The choices were limited so I had a Miller's Genuine Draft. Not my usual choice, but it quenched my thirst. 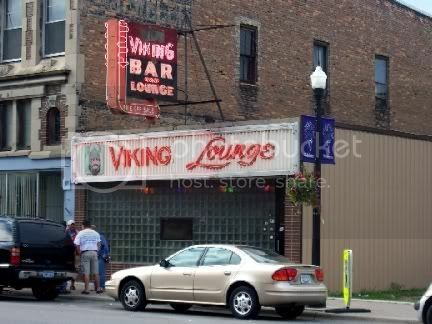 Afterwards I headed down the street to one of the few remaining bars in town. Kind of sad, really. 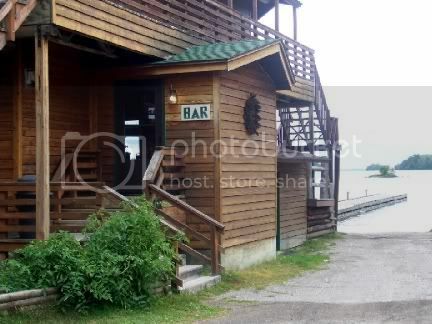 At one time International Falls probably had more than a dozen bars. This one is a good one though. 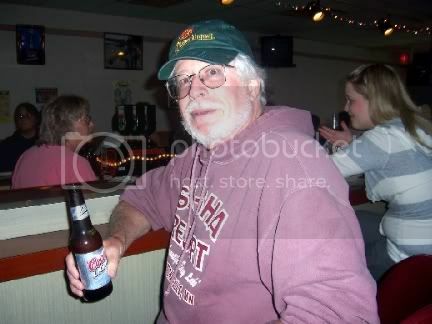 I missed nickel night where they crack a keg and beers are only a nickel until the keg is emptied. I noticed that nobody was drinking draft beer so I figured I better play it safe and have a bottled beverage myself. Sometimes you do get some interesting flavors if you get a draft beer in a small bar that doesn't clean their lines very often. I had a Coor's Light and there really isn't too much I say about that except it was cold, and wet. Now one might think that winning a fishing contest is largely a matter of luck, and I am sure that some of that enters into the equation. However the winning team this year, Dale Labelle and Karl Howells, both from Canada, took third place two years ago and second place last year. 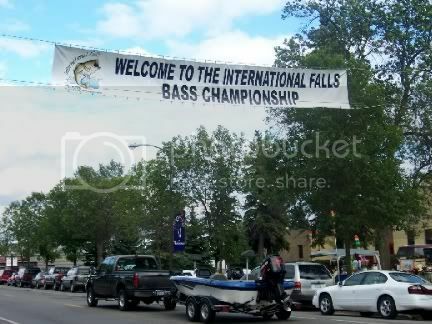 Given that this was only the third annual International Falls Bass Championship, they have done right well for themselves. I am not sure where my buddy Woody finished, I never did see the final tally, but I don't think he finished in the money. Maybe next year.